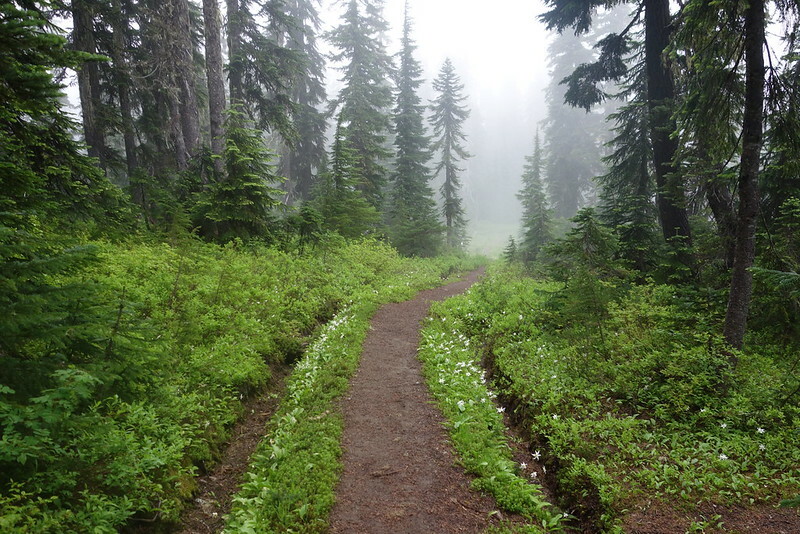 WA PCT, Day 2: Evening All Afternoon – Hi, Alpine. I woke up this morning in a cloud, to water vapor blowing swiftly over my saddle in the rising morning light, and all my things soaked with condensation. I guess it’s going to be that sort of day. 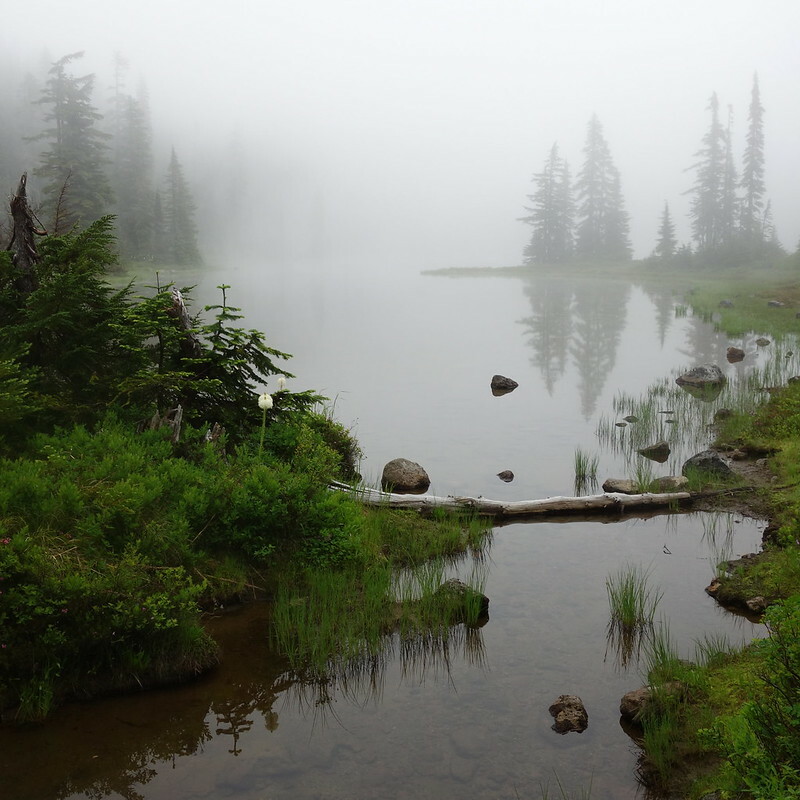 I packed up gingerly, dancing around to avoid the several hundred mosquitoes who’d arrived early for a breakfast buffet, and swatted my way down to Blue Lake, where I filtered some water and it started to do something between rain and snow. 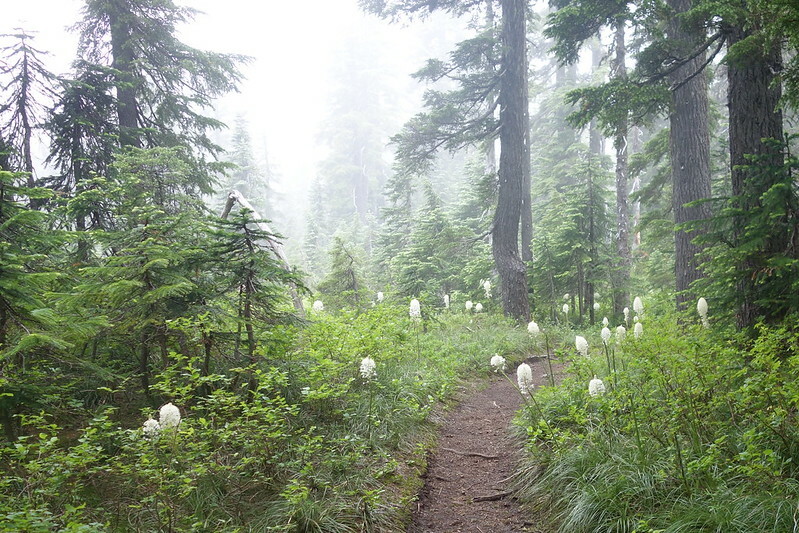 The rain flitted around for a while, jumping from snow to hail and back again, as I followed the increasingly soggy trail through fields of beargrass on the side of East Crater, then down to Junction Lake, where another set of mosquitoes were waiting to welcome me. I spent most of the morning in my head net, which was maybe not the best idea, because it made everything seem darker than it was. Underexposed. Like the day was stuck at dawn. I stopped again for water at Deer Lake, the last reliable source for ten miles. 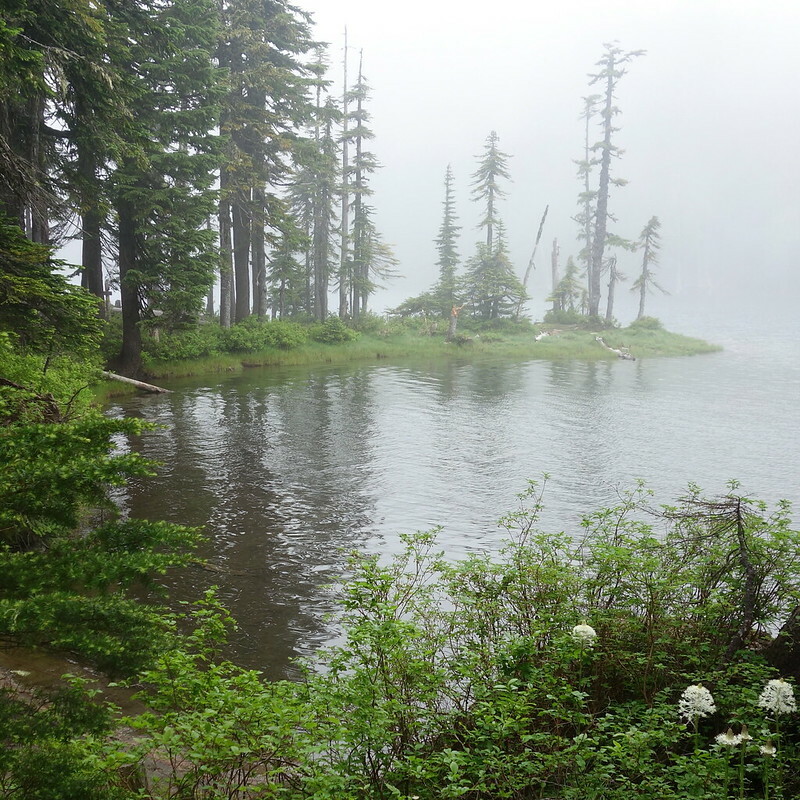 There were bright white and yellow new lilies on the shore, growing out of mud and at the edges of snowfields. I remember reading about this spot in someone’s blog years ago, and it felt sort of cool to be going through myself. Even in air thick with rain and biting bugs, there’s something grand about passing through the same path as so many others. From the lake, I made my way along the western edges of Bird and Sawtooth Mountains. There’s more snow here than I expected—nothing bad, but constant fields along the trail and edges of the lakes. It’s somehow making me feel at home, as is the rain. Familiar discomforts. Maybe this will all be okay after all. 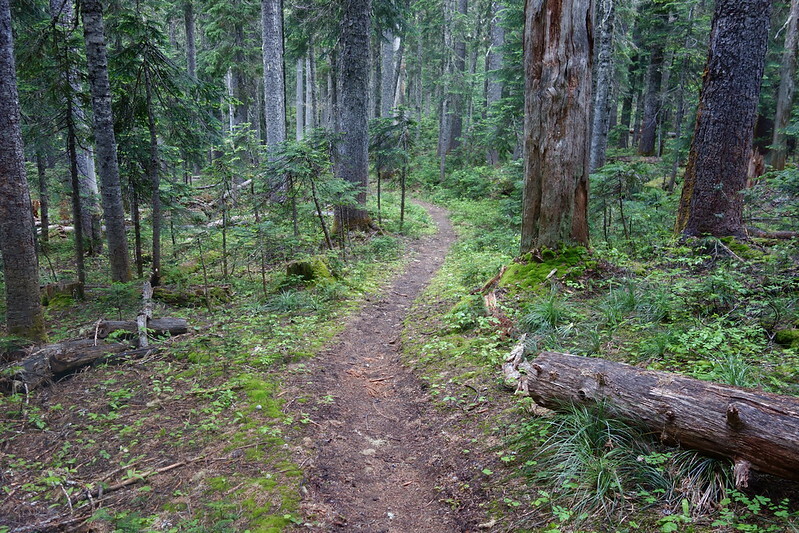 I was soon joined by a young guy, maybe early twenties, who called back to his buddy as soon as he saw me, “Person!” He was trundling down the trail, in leaps and bounds, wearing soaked bulky rain gear and swinging an old ax. 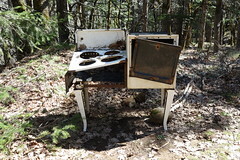 Turns out they were a two-man trail crew, who’d just finished logging out most of the wilderness. I thanked them profusely for their work, but they just laughed, and said what fun it was. “We get to play in the woods all day, like when we were kids.” I thought about that as I watched them walk away, bounding through the rain soaked flowers. As soon as I left Indian Heaven—like, within ten feet of the wilderness sign—the mosquitoes just disappeared. It was marvelous. 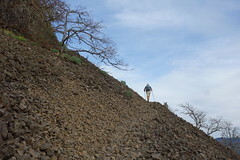 I walked through the fading rain for another few miles, across a road and several jeep tracks, then stopped between the two Twin Buttes for a snack. 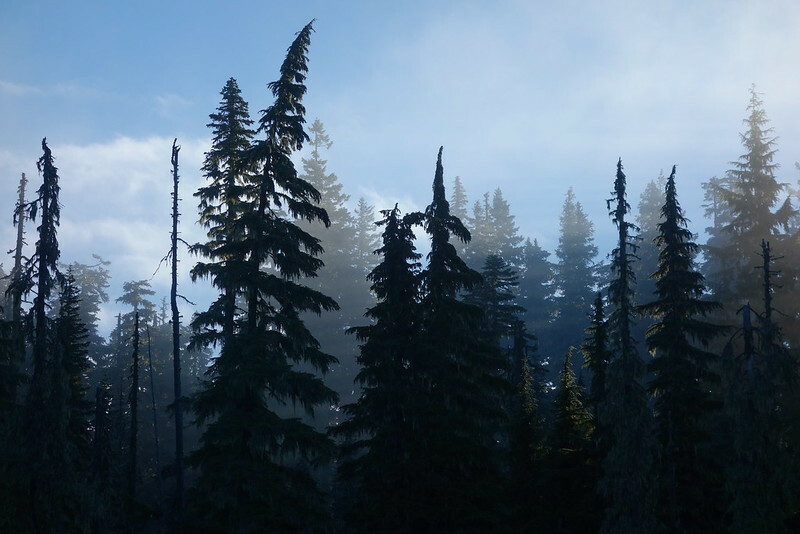 The sun was starting to make small inroads through the clouds, and I smiled through my Snickers as I saw its light glisten on the needles of the nearby dripping pines. And I thought again: maybe this will be okay after all. The last few miles have been easy, up and down through muddy marshes and flowers, with hills in the distance fading in and out with shifting clouds. It’s been raining. And it’s going to rain. But I’m sitting here now, at the side of a rushing stream, just full from lunch, dry under the bows of a brilliantly bright green tree. I’d been planning to stop here for the night, but it feels too early for that, and anyway who knows what’s ahead. I felt like a real hiker this afternoon. 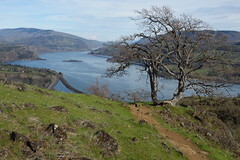 After lunch, the trail descended steeply to Road 68 and Trout Lake Creek, where a huddle of hikers crowded into a couple developed camps. I waved and stopped to filter water, but for some reason didn’t feel like stopping to be social. From the creek, it was a bit of a climb, past a half dozen old 4×4 tracks, now hummocked and probably impossible to travel with anything but a dirt bike. Why did these things get built? And why have they been left? Are they old logging roads? This section feels full of recent ruins, not yet old enough to be history, but no longer part of anyone’s life. Civilization on its way back to wilderness. 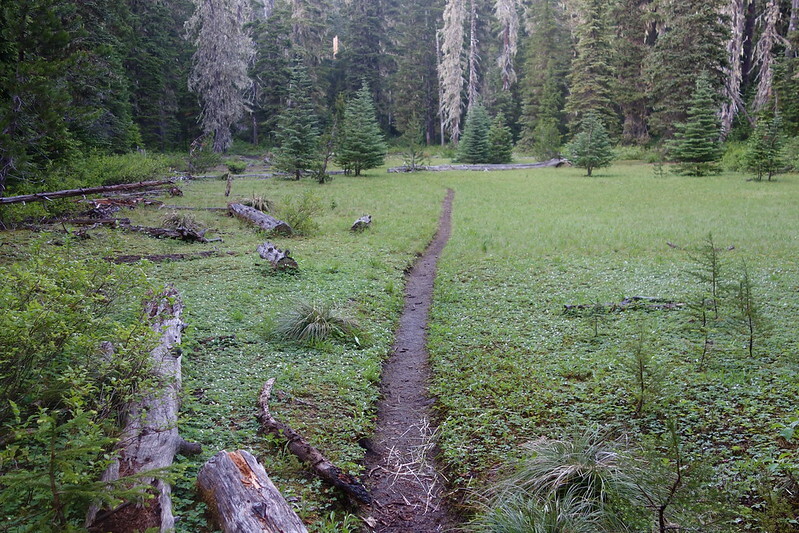 Camp tonight’s a dry meadow a thousand feet above Trout Lake Creek. The sun’s been cutting through the clouds, and I can almost—almost—imagine my things drying out. I had dinner in the meadow, walking back and forth again to avoid the bugs. And now I’m in my tent, cozy in all my layers, writing through foggy breath in the bright glow of my headlamp. It feels premature to say, but this almost feels like it’s fading into home.